For more information on any chairs that are for sale below, please contact the telephone number or email address supplied with each chair entry. `H` shaped stretcher. It has been stuffed throughout with horse hair. 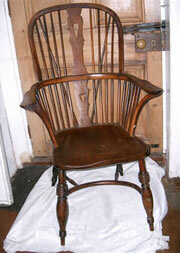 A very early Windsor chair c1780/1800 in yew and elm with a crinoline stretcher with excellent patina and colour this is a lovely chair. 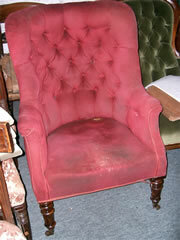 A very nice high backed library with buttoned back and turned legs. This chair requires recovering which can be arranged. NOTE : THREE (3) of the chairs are matching with round edged backs and the other THREE (3) are matching with square edged backs. 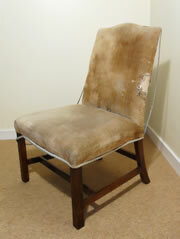 See photo below showing all 6 chairs together. 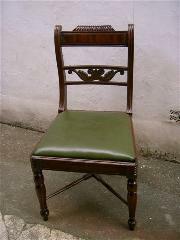 Eight late Regency mahogany chairs, 2 carvers with scroll arms and six singles all with drop in seats and sabre front legs, all in excellent condition. 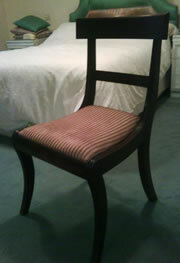 SOLD: Six Regency Mahogany Chairs with drop in seats. 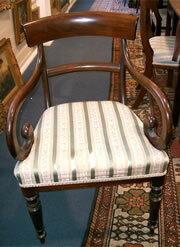 Six Regency Mahogany Chairs with drop in seats. The Georgian period is often referred to as the Early and Late Georgian. Early Georgian covering the reigns of George I (1714-1727) and George II (1727-1760). Late Georgian that of George III (1760-1811). 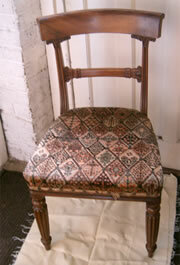 The Regency period covers the reigns of Kings George III and George IV, from 1810 through to 1830. 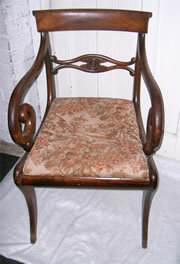 Though of course styles of antique chairs from this period will have carried on being produced for a few more year after. In France this would be the Restauration period and in the US the Later Federal. And resides between Late Georgian and William IV periods. 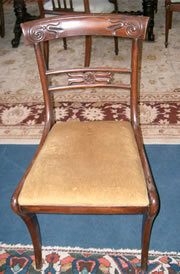 Mahogany was the principle wood used in the construction of both Georgian and Regency chairs throughout the periods. There are several types of mahogany, which was imported into England from around 1730 when it became very popular with cabinet makers, both in its solid form and as veneer. High quality mahogany will naturally have a rich golden colour, though the Victorians preferred to polish it to a rich red colour a major clue in identifying Victorian furniture. To visualise the Regency Period, you need only think of Jane Austen novels and the Napoleonic wars.